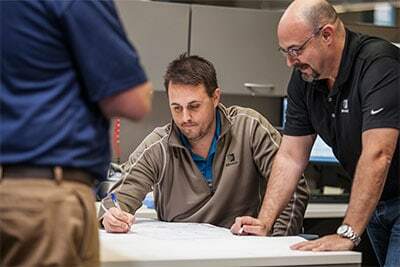 Because Brandt offers solutions at every stage of your building’s lifecycle, we understand how the design of your project can affect everything else—including your budget. We offer customized conceptual strategies, in-depth budget estimation, and project coordination to help you achieve more productive, energy-efficient operations. We employ a pre-construction design-assist/design-build approach using building information modeling (BIM) to simulate your building’s environment. As a result, we can integrate designs that accommodate unique architectural challenges for faster, more accurate construction cycles. Before construction begins, we have already minimized the chances of delays and cost overruns. Our experienced team also continuously reviews designs and cost/benefit analysis for budget compliance. Plus, we have extensive experience partnering with a wide range of design and construction firms to ensure every challenge is resolved for better designs — and better buildings. As pre-construction planning gives way to on-site construction, careful budgeting and contingency management keep your project on track. The design/build process must be carefully orchestrated; successful construction is a coordinated effort. That’s why Brandt provides all aspects of construction workflows during the design and planning phases. We offer an integrated approach to streamline construction practices, from spatial coordination to fabrication to occupancy. We incorporate key constructability principles to ensure your facility is sustainable and affordable from its first day until its last. Plus, Brandt is your single point of contact for every step of the construction process for seamless control that expedites construction, minimizes errors and reduces total cost of ownership.